Lock in a great price for Hotel Summery - rated 8.3 by recent guests. The staff were so friendly and helpful and the hotel clean and welcoming. Lovely hotel. My children especially loved the mummy cat and three kittens living in the hotel garden. The location and staff were excellent. The bedroom and the shower could do with updating, but ticked the box. Towells & sheets seemed to be changed everyday. Pool area kept very clean. Excellent for a relaxing holiday, plus all people on holiday were so friendly and many were revisiting the hotel. Reception staff were always so friendly and helpful. Nothing too much trouble. I wasn't happy with my original room but this was sorted efficiently by the next morning. I liked the fact you could either sunbathe around pool or on beach and it wasn't a problem to take sunbeds to beach as long as you returned them. Very close to the ferry terminal to Argostoli. Friendly, helpful and polite staff. A family hotel. Good breakfast. Cleaning and changing towels daily, changing sheets every two days. The refrigerator was out of order, the replacement was immediate! The location of this hotel makes it easy to walk to all the local restaurants and town square, there's a good beach opposite and a few minutes drive to some superb beaches on the south coast of Lixouri .The sea view from our balcony was stunning. It is excellent value for money. The two main reception staff who seem to alternate their shifts ( one female, one male ) were both exceptionally friendly and helpful -we felt very welcome in the hotel and were given local advice which proved useful. The hotel was very clean. The staff very friendly. The prices were reasonable. The pool was lovely. Free air con was a bonus. Located in Lixouri, amidst beautiful gardens, Hotel Summery, family-run for over 30 years, offers a swimming pool and children’s playground. 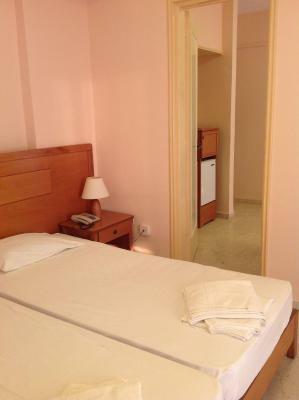 Air-conditioned rooms feature furnished balconies with Ionian Sea or city views. 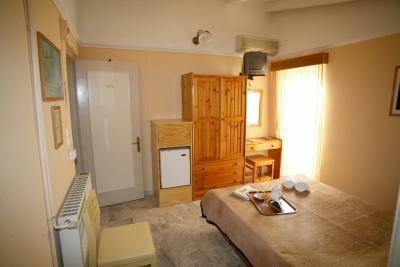 Each room at the Summery is equipped with TV and fridge. Bathroom amenities and hairdryer are standard. Free Wi-Fi access is provided. Breakfast is served daily on the sun terrace among the palm trees and bougainvilleas. Guests can relax around the pool or have a drink at the snack bar. Room service is also offered. Windsurfing, hiking and table tennis facilities are available. Staff at the 24-hour front desk can help guests with travelling information to further explore Kefalonia, or with car rentals. Baby sitting services can also be provided. 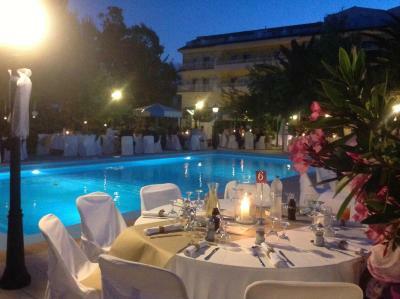 From the hotel, guests are within short walking distance from the town centre where there are tavernas and shops. The Pali peninsula features famous beaches including Lepeda, Xi and Mega Lakos. Free public parking is possible at the Summery. Hotel Summery has been welcoming Booking.com guests since 20 Sept 2006. When would you like to stay at Hotel Summery? All of these rooms have twin beds. 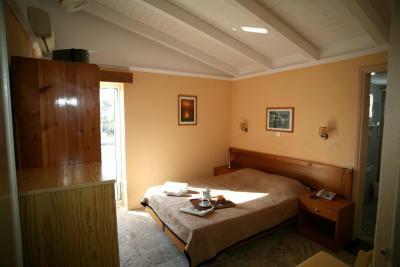 The rooms on the top floor also have a country-style decor and roofless verandas. The rooms in the rest of the building have a contemporary decor and balconies. Facing west, these city view rooms have balconies overlooking Lixouri town and the neighbouring hills. Some city view rooms have double beds, whilst the others have twin beds. Featuring 2 separate, air-conditioned bedrooms and a bathroom, this unit face west and their balconies overlook the hotel's front street and a quiet Lixouri neighbourhood. 2 TVs are available. The Summery is the creation of three brothers who shared a vision to bring tourism in the little town of Lixouri in the early 80s. Throughout its history the Summery has brought life to the town, it has given jobs to local people and made unforgettable memories to thousands of guests.Titika is the daughter of one of the brothers who is now running the hotel with a fresh look and enthusiasm aiming to offer affordable, good quality holidays with a distinctive Greek feel. Besides being a devoted hotelier, Titika is an award winning-no less artist. Her paintings,mostly seascapes, have largely contributed to the hotel's wonderful marine themed decor! House rules Hotel Summery takes special requests - add in the next step! Hotel Summery accepts these cards and reserves the right to temporarily hold an amount prior to arrival. Please note that dogs are welcome only if supervised at all times. Kindly note that the property will preauthorise the credit card for security reasons. Cannot find fault. This is a two star hotel which over-exceeds in many areas. The wonderful staff who always have a smile and a greeting for you and just can't do enough for you(!) and the amazing pool area and gardens.They are worthy of a five star hotel. No wonder so many people return year after year to this charming hotel. The rooms were quite outdated, shower was small and shower head needs replacing. AC leaked inside the room, but was fixed when we asked for maintenance. Linens need to be replaced especially the blankets which were stained. WiFi was very slow. Location was perfect, beach was ok but note you need to have your own towels and no chairs available. We used the oranges ones and paid for them. Breakfast was good, and plentiful. The staff were all very nice and helpful. This hotel was right near a supermarket and about 5min walk from the city center, would definitely recommend to stay here, but expect an outdated hotel. The rooms on the top floor have sloped ceilings. 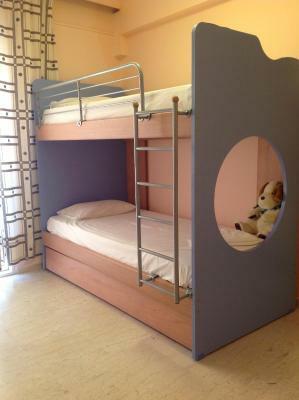 In the bedroom this is ok, but in some of the bathrooms the shower would not sit upright on the wall. Not much hot water in evening. Also hairdryer in original room had all the internal wires visible in the cable. A fire just waiting to happen!!! Breakfast breads and baked goods were stale. Location and facilities were good!! City View family room was quite noisy 24/24 hours. Even though closing the windows could be quite helpful, the air condition unit generated the same level or more noise. No flexibility in changing room. Everyone in the reception was very nice, assisting with tours, giving directions for my friends hotel, lending me adapter to charge my phone etc. The location is perfect, beach is just steps from the pool, food market is down the street also just a few blocks from to town and port. Perfect location, I only stayed 4 days wishes it was longer. Room next to the elevator, very noisy.